Chancers, Dancers and Romancers – a Tartan Army Tale! 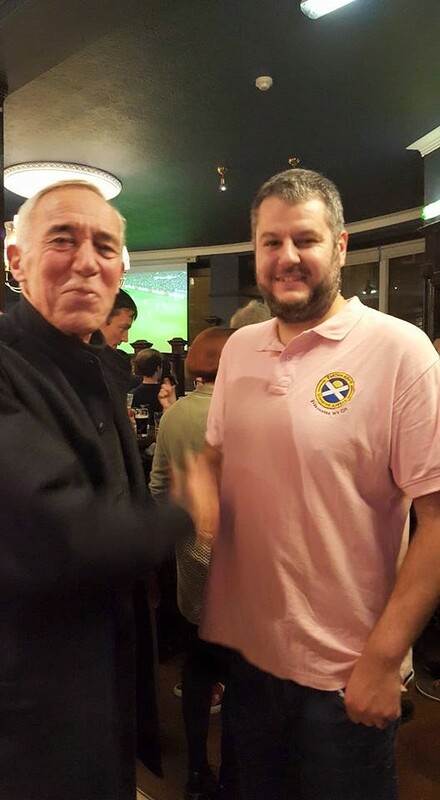 Kevin Donnelly is a long term Scotland fan who over the last five decades has followed the team to four World Cups, two European Championships and numerous friendlies. He has just written a book based on four Scotland away games in 1996-97. The book is called Chancers, Dancers and Romancers. It features two Scotland fans, Kenny Bradley and Gus McSween, as they follow Scotland to Vienna, Riga, Tallinn and Monte Carlo. This all sounds quite simple apart from the fact a nasty wee posh Scot called Atholl McClackit is looking to kill Kenny; his father-in-law wants Kenny to help with a jewel heist; and his real dad wants to introduce himself into Kenny’s life. The book costs £9.99 (inc 2nd class UK postage). Kevin is kindly donating all proceeds to the Tartan Army Sunshine Appeal. Yesterday evening, on behalf of the Sunshine Appeal, I handed the Chairman of the Temi Community an additional donation of 1412 lari. This was cash which was sent to the Sunshine Appeal by our supporters after they returned from Georgia. Martin, and the rest of the staff and children at Temi, are extremely grateful for your continued support. Anyone who was at the donation in Tbilisi, or has read about the organisation on our website, will have no doubt that the money you have donated will be put to extremely good use. Thank you!